Freelance writer specialising in serendipity: the art of finding wonderful things by accident or sagacity. Comments and suggestions always welcome! 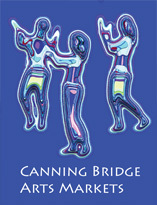 Please note Canning Bridge Arts Markets ceased operation on Sunday, 2nd June. This market is now closed. I love markets. I enjoy being outdoors, browsing the different wares on offer, talking to the stallholders, sampling unusual and tasty treats and stopping to listen to buskers. I even plan holidays to visit great markets like Eumundi in Queensland and Salamanca in Hobart, so I really can't explain how I've managed to miss the Canning Bridge Arts Markets for so long. The markets are held on the first Sunday of every month. Sponsored by the City of Melville in conjunction with the Rotary Club of Canning Bridge, they started in March last year. On market days Kishorn Road in Applecross is closed to traffic to create a family and dog-friendly space. Parking is readily available and it's also possible to reach the markets by public transport. As a bonus, the nearby Canning River foreshore offers lovely walking and bike paths. The area around the markets is also home to a number of great restaurants. The market offers a diverse and interesting range quality goods. Art, crafts and sculpture rub shoulders with gourmet food and garden tools. Nearby you'll find designer clothes, homewares, jewellery and more. In May produce and fresh food stalls will join the line-up for the first time. Check the website for a complete list of stallholders and the Facebook page for updates. Tired of browsing? Grab a coffee and enjoy some music, dance or perhaps a performance by the Bush Poets and Yarn Spinners. As well as shopping and entertainment, every month the market offers free children's activities. Recent months featured ZumbaAtomic, a free play area, craft and cupcake decorating. 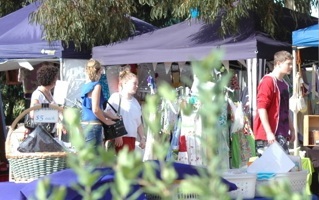 The Canning Bridge Arts Markets are held the first Sunday of every month (except January) from 9 am to 2 pm. See you there! Thank you for letting me know, I'll delete the article. I clicked onto the link provided and it appears that June was their final market. Definately reads that it was their last market in June! Glad I read down to the end of the article !